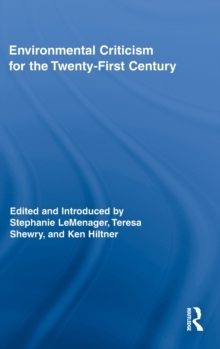 Environmental Criticism for the Twenty-First Century showcases the recent explosive expansion of environmental criticism, which is actively transforming three areas of broad interest in contemporary literary and cultural studies: history, scale, and science. With contributors engaging texts from the medieval period through the twenty-first century, the collection brings into focus recent ecocritical concern for the long durations through which environmental imaginations have been shaped. Contributors also address problems of scale, including environmental institutions and imaginations that complicate conventional rubrics such as the national, local, and global. Finally, this collection brings together a set of scholars who are interested in drawing on both the sciences and the humanities in order to find compelling stories for engaging ecological processes such as global climate change, peak oil production, nuclear proliferation, and food scarcity. Environmental Criticism for the Twenty-First Century offers powerful proof that cultural criticism is itself ecologically resilient, evolving to meet the imaginative challenges of twenty-first-century environmental crises.